I've now completed a 3 month experiment (March, April, May, 2011) at a tight $200/mo. grocery budget for our family of five. Throughout the experiment, I was able to maintain that $200/mo. budget (at least pretty close to it) each month. This has been a serious reduction in our grocery spending. 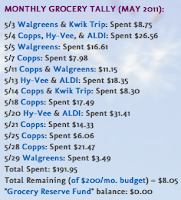 Knowing what I know now, I'm thoroughly embarrassed to say that prior to couponing (& when we were in what I refer to as "pure grocery cost oblivion"), we were regularly spending in the ballpark of $1000-$1200 on groceries each month. Ugh! Since couponing & strategic shopping, we've been saving a ton! Right away, our budget was easily slashed to less than $600/mo. & before starting the tight budget experiment, I found I was comfortably spending around $400/mo. Pulling in even tighter for this $200/mo. experiment seemed easier to do than I expected during the first month or so. However, as the months went along, grocery prices have begun to rise and our stockpile has begun to shrink. $200/mo. is feeling a little too tight at this point. It was great fun & a great learning experience to try this out. If you aren't already doing it, I highly recommend challenging yourself to a tighter budget. 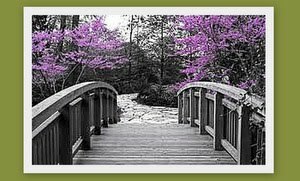 ~I became more picky about the deals: Following this tight budget really helped me to steer further away from the so-so deals. I found that I really zeroed in on the best deals & was not nearly as tempted to grab things that weren't at or close to their rock bottom price. ~I wasn't quite buying enough: Unfortunately, at $200/mo., I found that I was even steering away from buying enough quantity of the great deals, when they were available. I also found that at times I didn't have enough coupons to get the quantity needed to help us last through to the next sale. I'll need to decide whether I want to purchase more papers or order from a coupon clipping service so that I can stock up in larger quantities when prices are at their lowest. ~Shrinking stockpile: Especially with meat and produce prices on the rise, I found that our stockpile (especially of those types of items) dwindled quite a bit. ~Too many nights of "Hmmmm....what should we have": Evenings can be particularly busy for us with karate classes, homework, school events, etc. & I'll admit cooking & meal planning isn't my forte! I tend to (most of the time) throw meals together somewhat last minute. I prefer that our meal includes a lean protein + fruit + vegetable + a little whole grain. As our stockpile continued to dwindle these last couple of months, we were more and more tempted to order out or go out to eat because we didn't have an abundance of great food to choose from. Where does our grocery budget go from here? ~I've decided to loosen the reigns on our grocery budget a bit. I'm thinking somewhere in the ballpark of $350/month will probably be quite comfortable for us....and we'll still be saving over $800/mo. as compared to our pre-couponing grocery spending. Proud of you! You did an awesome job! $350 for a family of 5 is music to my ears (family of 5 here as well). Btw, you and Danielle helped me saved $20 (10 $1 coupons) at Cops yesterday during their double coupon day! Thanks a bunch! Wow! I know you've helped me save oodles of money. I was never a Copps shopper and until you pointed out the rolling gift card idea I didn't see the point of spending $25 to have coupons double. My grocery money goes a lot further now that I follow you. I have been wondering what kind of meals you've been able to feed your family on $200/month. I couldn't do that. We're a family of 4 and we average $350/month though I expect that drop some now that my freezer is packed. Have you been tracking how often things go on sale? Perhaps you could share that info along with your deal posts? I think meal planning is super important, and having some things pre-coooked meat in the freezer for those night when life is so busy. Not full cooked freezer meals but browned ground beef, or chicken breasts that have been cooked and shredded. I also cook beans and freeze those instead of buying canned. Having these things on hand help me not want to order a delivery pizza or go out to eat. Thanks again, for all your help saving me money! Great job and super explanation about what worked and what didn't. The previous comments you got offer lots of good advice as well. Thanks for doing the experiment! You learned a LOT about yourself in this budget experiment and had some great learning experiences! I know you took my Meal Planning 101 class - it's just taking the time to DO it, LOL! Batch Cooking, post shopping/pre grocery put-away food prep, bulk meat breakdowns, freezer marination, crock pot meals and the good old "cook once, eat twice" are live savers in our house. I know my $100/month budget is going up the end of this summer. We have a growing kid and prices at the stores are projected to JUMP in a few months, if you follow the futures market. Not to shabby - I kept it that low for almost 2 years, LOL! Congratulations on completing the project. How many people do you feed on your budget? I too find that $200 is too tight for my family of five...for the very reasons you have mentioned. Instead I have a $250 grocery budget, which seems to work much better. 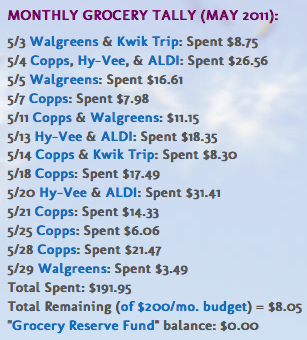 I will probably have to increase it a bit this summer though, as I will have three boys home all summer, and my oldest especially go through A LOT of fruit...hopefully Aldi will help me with some great deals on fruit. So far their cheap and fabulous watermelons are a big help.